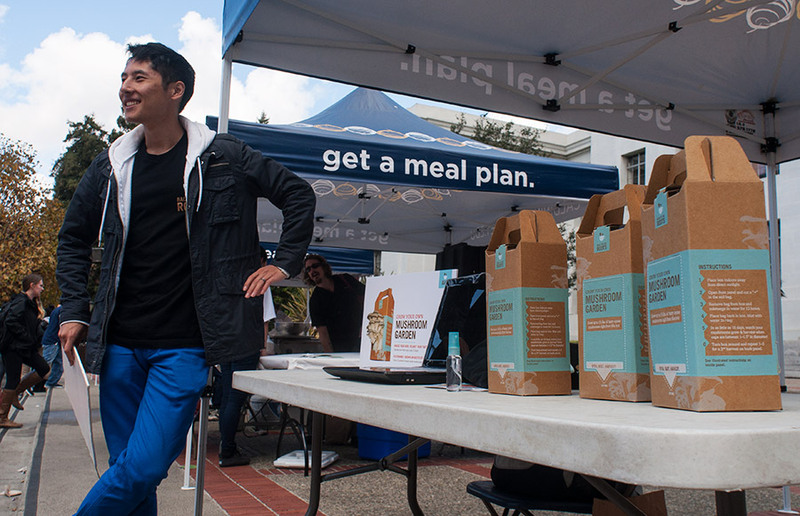 Gary Duan, from Back to the Roots, a company founded by Berkeley graduates, holds a raffle for a free &amp;amp;amp;amp;amp;amp;quot;Grow Your Own Mushroom Garden&amp;amp;amp;amp;amp;amp;quot; as part of Food Day events put on by University Health Services. Like a colorful cornucopia, Sproul Plaza was laden with sustainable food organizations, cooks and activists who gathered for Food Day Wednesday. The campus celebrated the national event founded by the Center for Science in the Public Interest for the second year in a row, though it was organized locally by Cal Dining’s Sustainability Team for the first time. 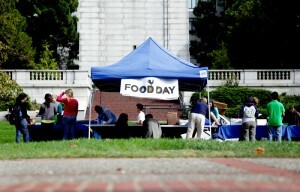 According to Monica Harnoto, a Cal Dining sustainability intern and event organizer, the purpose of the event was to promote healthy and sustainable food and provide a platform where students could learn about how to participate in the local food movement. The campus community enjoyed food samples from Dojo Dog, Ritual Coffee, Purity Organic and Annie’s Homegrown. Also in attendance were food-justice and sustainability advocates, such as the Berkeley Student Food Collective, Oxfam America Club at Berkeley, the Residential Sustainability Program and BareAbundance. BareAbundance, a student-run nonprofit that works to collect excess food from Cal Dining and other local vendors and distribute it to low-income individuals, held a raffle for a basket of cereal, peanut butter and other foods that weighed one pound each. The $1,500 cost of the event was paid for with a grant from the ASUC Auxiliary’s The Green Initiative Fund. Katherine Walsh, the initiative fund’s coordinator, said most of the funding went to setup, fliers and the cost of food, tables and supplies. Junior Nadia Tsado said the event was “a good use of funds” and that she thought it was a good idea to bring in outside vendors because doing so showed that sustainable food was growing. Contact Levon Minassian at [email protected].